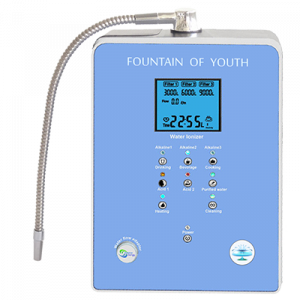 The Fountain of Youth-700 water ionizer is not at all short on features, especially considering its record setting low cost of less one thousand dollars. It has a button control panel and seven Titanium plates with platinum coating, which works to extend the life of the unit. 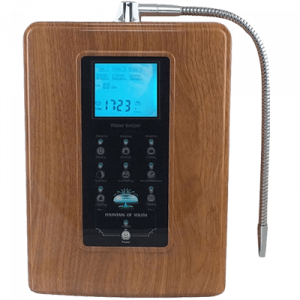 The LCD display shows water-flowing volume, water process, PH, ORP, Ionization indication and Ionization stages. The PH Range is 4.5 to 11 with a max negative ORP of -850MV. It has an internal active carbon filter and produces clean, fresh-tasting water. 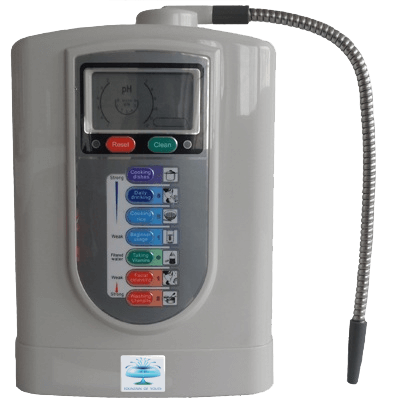 State-of-the-art water filter removes chlorine, benzene, fluoride, trihalomethane, radon, pesticides, VOCs and hundreds of other harmful pollutants found in tap water. 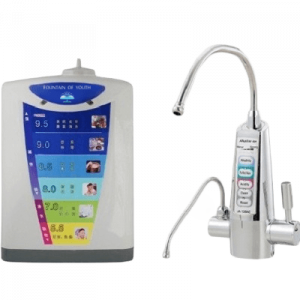 Four levels of alkaline water, one purified water, and two levels of acid water. A cleaning light illuminates when the machine begins to automatically clean itself. Limited Lifetime Warranty: Also includes a 30-day satisfaction guarantee.